The other day, I was doing a podcast interview with Mukesh Gupta from India. He floored me with his closing question: "What's one thing that's obvious to me, but most people are totally blind to?" No one's ever asked me that before. But I immediately knew the answer. It's a problem that's pervasive in virtually every sales organization I work with. No one ever thinks or talks about it – yet if salespeople had this information, it could change everything. 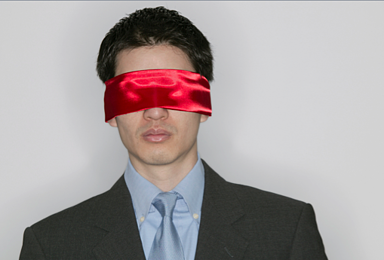 The blind spot is knowledge about your biggest competitor – the status quo. Until you have a strong grasp on how your prospects are doing things today, it's extraordinarily difficult to fully grasp the business value that you can potentially bring them. If you can't clearly articulate a strong value proposition based on a deep knowing, you craft lousy email and voicemail messages – and don't get your foot in the door. Plus, it's darn near impossible to have an intelligent conversation because you don't have a clue as to what you should be asking about or exploring with them. At its core, sales is about change. If a prospect can't see enough value in switching, they'll stay with what they have. If it's hard work to get buy-in, they'll stay with what they have. Even if what you offer seems better. But if you fully understand the limitations of their status quo, you'll have a different discussion with them. If you know what their objectives are, you'll be able to explore and expand on the difficulty of achieving them if things stay the same. It's only when you truly understand the status quo that you can appreciate the difference you can make. And, when you know that, you work harder because you know that what you do matters. So let me sum it up. By immersing yourself in the status quo, you know WHY people change – the value they receive. This in turn, helps you create better messaging ... which gets you into more conversations. And then, because of what you know, you ask better questions ... which helps people realize that changing is the smart thing to do. The first seller to set a vision of what's possible has a 74% chance of winning the deal. Excuse me ... did you hear that? 74% chance of winning the deal. I'll take those odds anytime. And it all starts with knowing the status quo. Don't be blind to it any more.